[update 2017] in case you see this being used on the web somewhere, there's only one authorized license, and that's for an album cover. 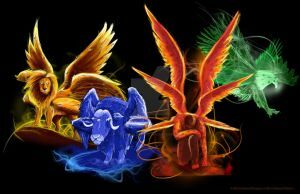 Love this picture with the winged creatures and the blues and pinks it looks like a sunrise or sunset. Lots of wonderful details. I found out about you through Skape Rend the RPG because I heard you were going to make art for it. You do amazing work. oh thanks so much haha, I have a lot of really old drawings that served as early concepts for that game. 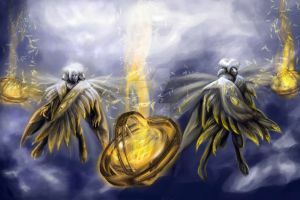 For instance; a lot of times angels are portrayed as cute little babies with wings. Angels are NOT cute little babies! They are powerful, holy servants of GOD! to glorify HIM! They are agents of both holiness and judgment. Your picture portrays that.